I liked the album cover . People say I sing the sunny side of the blues. We thought we had discovered this “unknown” and started talking him up to our friends. Turns out, they’d been listening to him for years. but this is the most unique venue. sights like this when you live in Queens. I feel like I’m on an album cover. In January 2008, Bibb came to Sandpoint, Idaho, six hours away. It was close enough. Friends banded together and we drove through an epic snowstorm for a magical evening. Unforgettable. 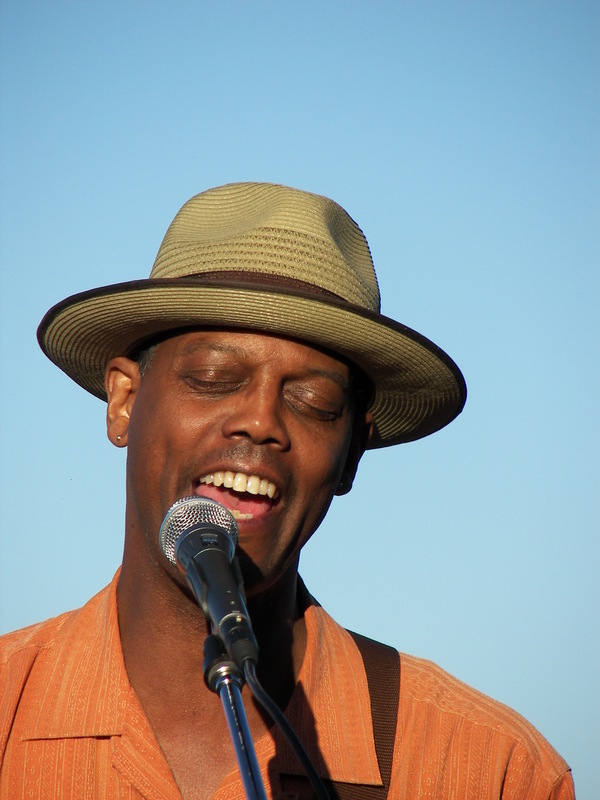 A month ago we learn that Eric Bibb would again be in our region. Anticipation. A thought occurs to someone brilliant: why not bring him to the Rim for a concert? Sitting on the edge of Joseph Canyon, The RimRock Inn is what’s called a destination restaurant. Our friends have worked hard to make a meal at the Rim an exquisite occasion. They seated 80-100 people on the outside deck with Mr. Bibb on a platform five feet away. He introduced each song with a story, some background or introduction. 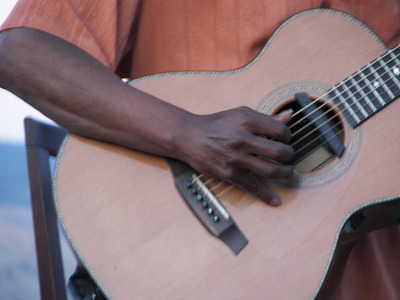 He plays some thumping 12 chord progressions, clap-along, foot-stomping songs. But he truly excels, I think, with love ballads that make you want to hold the hand of the one you love. suitable topics for the blues. The sky was a robin egg blue. The temperature teeter-tottered between perfect sleeveless and grab a sweater. 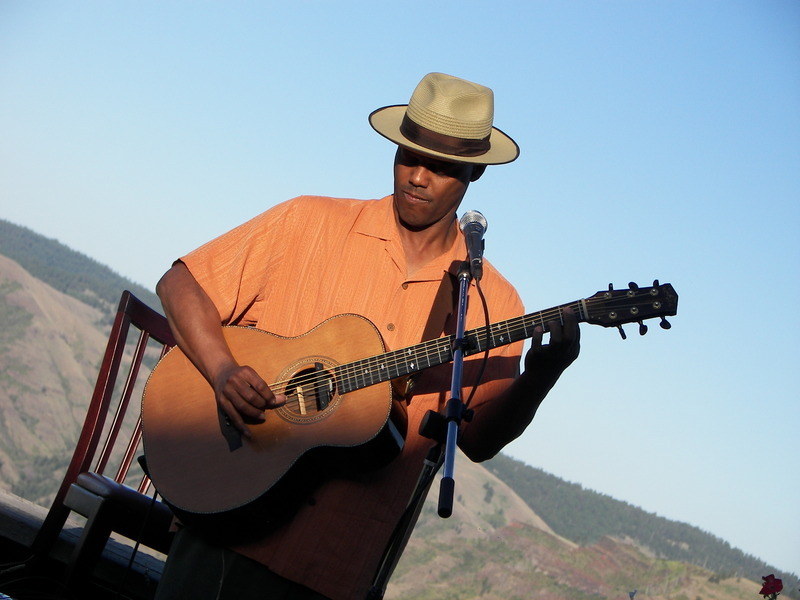 Our friend Darrell Brann opened with a full repertoire of crowd pleasers. The aroma of fresh bread was followed by a salad with crumbles of chevre; prime rib and baked potato entered; dessert was your choice of rhubarb, marionberry, pecan, apple or mud pie. it in every set I play. And I’ve done that for twenty years. to sing a song with a blues feel and she wanted to sing in English. So here it is: a Swedish-gospel-blues-in-English song. During the intermission and after the concert there were opportunities to talk to Eric Bibb and his wife. I told him one of his newest fans is my friend’s mom, who recently received a terminal diagnosis, whose days are numbered. He asked me to pass on his greetings. Isaiah and his folks were at the concert. Isaiah, saved from a deadly brain injury. sweet gratitude the air I breathe. This entry was posted in Uncategorized and tagged ericbibb, music by alivingpencil. Bookmark the permalink. This sounds like such an intimate gathering…. I mean, to be able to talk to Bibb and his wife. Neat! And he paid high compliments to your locale. Huge props! Oh, Carol, I love your descriptions in this blog entry! Esp. describing weather as “teeter-tottering”! 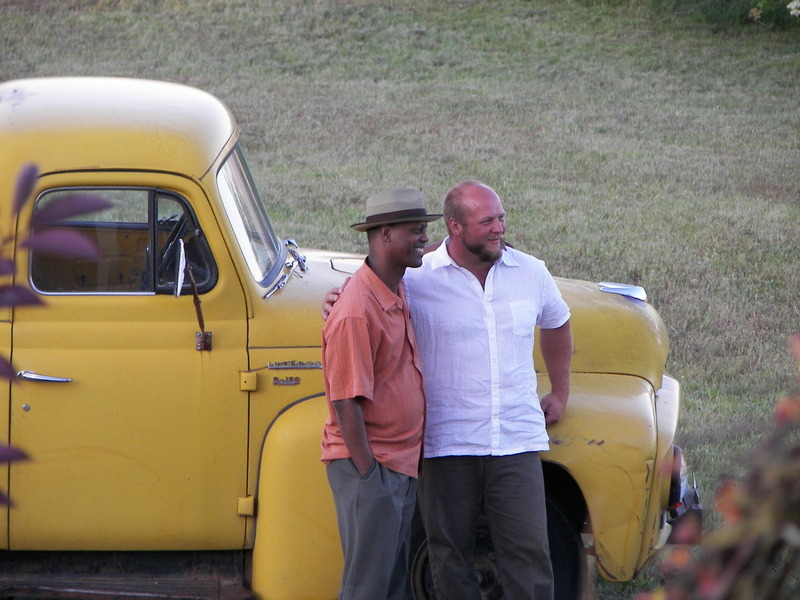 Being there with so many wonderful friends who also like Eric Bibb so much must have been an added pleasure. How come no photos of his wife? (the always curious one asked!). One other question: Who does the yellow truck belong to? Remember Butch’s old truck at CCBS, that he painted blue and purple? Reminded me of it! Guess I”m going to have to check this guy’s music out….your descriptions sound like a perfect evening….and Isaiah was there!!! So glad he’s out and about!